This is the second in my series of posts about the perils and pitfalls of relying on other peoples’ online family trees. In the last post I commented about some of the issues to be aware of in relation to dates. I will now look at some of the dangers signs in regard to places. No places stated for an event. If a record has been found that proves a piece of information, it will almost always show where the event had happened. For example, to know that someone was baptised on a particular date, the source is probably a baptism register for a particular church, and therefore, it should follow that we know where the baptism took place. There are always exceptions (for example, a family bible might give dates but not places), but these are likely to be the minority of pieces of data on a family tree. If an online tree you have found generally only has dates and no (or very few) places recorded on it, the chances are that the researcher hasn’t diligently gathered the information, or at least not documented it, and so be dubious. They may have just copied the information from elsewhere. The records don’t survive earlier for that place. Parish registers are one of the main sources for baptisms, marriages, and burials, but their survival varies for each parish. If the records haven’t survived, your family won’t appear to exist, but could have been in that place all along. The records haven’t been indexed any earlier. They may still exist in an archive where they have been deposited, but a researcher only working online hasn’t found them simply because the records aren’t online. The name doesn’t appear in quite the way you expect it to, for example, a spelling variation. In s recent project for a client, I was researching their Elstrop ancestors. However, in earlier records, before about 1820, the name was recorded as Healstrop. Phonetically the names are very similar, an H often being nearly silent in English, but the computer algorithms use by online family data providers weren’t smart enough to consider these to be the same, so searching for Elstrop didn’t show up results for Healstrop. This could have lead an inexperienced researcher to think the family weren’t there. By searching the original records, page by page, reading the original handwriting, name variations like this can be detected, and the family progressed back further. I do a lot of work for clients that have found an online family tree, such as those on Ancestry or MyHeritage, and so I am often asked to use these as a starting point. I have therefore seen a good many over the years, presented in this series of blog posts are some of my observations about where people make mistakes, and how you can get an idea of how accurate what you find might be. Firstly, I am not completely against the sharing of genealogical data online (if there are safeguards over data about living people), although I do personally keep my trees private—I have had people take the data that I have spent many hours carefully researching, and then tagging on complete nonsense. Therein lies the problem: the data they contain is only as good as the research skills of the person that created them, or that blindly copied them, and carried on adding to them. In this post, I will look at some of the “danger signs” with an emphasis on dates and places, that suggest the data you have found in an online tree is probably wrong, or at the very least, questionable. No exact dates: for example, a year only. Sometimes an exact date cannot be found, and so a date might be an estimate, or based on an age at a known point in someone’s life. This should really be the rarity and is usually a sign that someone hasn’t found a record that proves what they are looking for. Even if this is the case, the date should really be expressed as approximate, for example “about” or “circa”, to show that it is such. Most genealogical software (including Ancestry’s online tree) can handle this sort of ambiguous date. The wrong kind of dates: Prior to 1837 in England and Wales (1855 in Scotland), it is more usual to not have an exact date of when someone was born. There are always exceptions, but for most ancestors the closest date we have is likely to be the date of their baptism. Whilst a baptism usually occurred within a few days or weeks of a child’s birth, that isn’t always the case. Sometimes parents would have a few children baptised on the same day—in a family baptism—the older children possibly being several years old. A similar phenomenon occurs with burials and deaths. Before the start of civil registration, it is more usual to have date of burial—probably only a few days after the death—than it is to have the exact date of death. If a tree has only birth and death dates for people born or died before 1837, then be warned that the author probably doesn’t know what they are doing. Not allowing for the Julian Calendar: Prior to 1752 in England and Wales (1600 in Scotland), the Julian Calendar was in use. Under this, New Year’s Day was not 1 January, but 25 March (Lady Day) So March was the first month. Out of interest, this is why some months sound like numbers, but they don’t match with their current numbering: September (Sept is seven in French, but September is the 9th month); October (An Octopus has eight legs, but October is the 10th month); November (Novem is nine in Latin, but November is the 11th month); December (Decimal is ten, but December is the 12th month). The consequence is that between 1 January and 24 March, the people at the time would have considered the year to be one less than we now would. For example, if we found a baptism of an ancestor born on 14 February 1600 (as shown in the original register), this would be in what we would consider 1601, and therefore, by convention in genealogy, we would write the date as 14 February 1600/1 to make this clear. To the best of my knowledge, the Ancestry tree doesn’t support this kind of dating, so it is unavoidable to correct the date to one form or the other. However, sometimes an amateur has not properly interpreted this date. For example, it would be quite possible for a child to be baptised on 31 December 1700, and buried on 1 January 1700, i.e. the following day, which is better expressed as 1 January 1700/1. When the British Empire switched to the Gregorian calendar (which replaced the Julian Calendar), an adjustment was also needed to bring the days back in line with the equinoxes. The Julian calendar didn’t allow properly for leap years, and so had been getting out of synchronisation for nearly 1800 years since it was introduced in 45BC. Therefore, in the British Empire, 2 September 1752 (a Wednesday) was followed by 14 September (a Thursday), with the lost ten days adjusting the calendar back to where it should have been. Obviously, if an online tree you have found showed that someone in the British Empire was born on 5 September 1752, be very wary of the accuracy. Further information can be found about the Julian Calendar on Wikipedia. In the next post I will continue to look at some of the danger signs to look for in online trees. The following is based on some research I did for a client during my work as a professional genealogist. It has been reproduced here with his permission. I would never disclose details about a client’s research without their permission to do so. It does show some advanced techniques that are sometimes necessary to overcome brick walls in research, even when ancestors used different surnames. The research concerns Charles Stratton (although the name is sometimes recorded as Strattion). It was already known that Charles had married a lady named Mary Lewis at All Saints, South Acton, on 14 September 18911. The entry of the marriage from the parish register recorded that Charles was then age twenty-seven, a bachelor, a labourer, the son of Charles Henry Stratton, also a labourer. Taking the above information at face value, he was probably born about 1864, and so we could reasonably expect to locate him on the 1871, 1881 and 1891 census returns. Yet, he could not be located on any of them. Charles died in 1896 before the next census after his marriage was taken. A search in the General Register Office Index of Births for boys named Charles Stratton (and variants) failed to show any particularly promising matches. However, there was a baptism of a Charles Stratton on 12 June 18642, at St. Stephen Shepherds Bush, Hammersmith, which had been located by way of the extensive London area parish register collection available through Ancestry. This boy was recorded as the son of Charles and Mary Ann Stratton, of 5 Williams Cottages, Latymer Road. It wasn’t yet confirmed that this was the correct baptism. Even with the above, it was not possible to locate the family on the above mentioned census returns under the name of Stratton or variants. Locating them on the census really was the best chance of being able to follow the family back further. Or at least eliminate the 1864 baptism as incorrect. I therefore did what I would call an advanced census search. By this I mean that I searched for all boys named Charles (no surname was specified), born about 1864 in Hammersmith, whose parents were recorded on the census as Charles/Henry and Mary Ann. You would be surprised how few matches this sort of search brings up. There was one entry which stood out on the 1861 census. This was for a family headed by a Charles and Mary Ann Smith, who had a son named Charles, then age seven, born in Hammersmith. They were living at 1 Charlotte Terrace, Hammersmith3. Also in the household were some younger siblings, including a daughter Elizabeth, then age just two months. A search in the General Register Office Index of Births did indicate that there was a girl named Elizabeth Stratton whose birth was registered in the area in the first quarter of 1871. A copy of the birth certificate for this Elizabeth Stratton was obtained4. She was born on 19 February 1871, at 1 Charlotte Terrace, Hammersmith. Therefore proving that the Stratton family had been recorded on the 1861 census as at that address as Smith. This girl’s mother’s maiden surname was Fisher, and when a search was done in the General Register Office Index of Births (the newer version as re-indexed with mother’s maiden surnames), Charles’ birth stood out. His birth had been registered as John Charles Strattion. So why should the Stratton family appear on the census as Smith? There was a small possibility that it was a transcription error by the census enumerators. The pages of the census that we now see (1911 excepted), are not the forms completed by the household themselves, but they are summary books copied up from these returns. Copying up is a process in which errors can creep in. So, if the householder had poor handwriting, perhaps Stratton had been read as Smith. This is however quite a wild error. The Stratton family were found on the 1871 census, again as Smith. This time they were living at 13 Manchester Street, Kensington5. The head being recorded as Henry Smith (using his middle name). I would speculate that the household had intentionally chosen to conceal themselves by using the surname Smith rather than Stratton. The above represents some of the barriers that can meet genealogists in a complicated case, even in the Victorian period: surname spelling variations, use and substitution of middle and first names and using completely different surnames! On going to carry out a routine client order this morning, I noticed a change to the General Register Office website. It would appear that the General Register Office www.gro.gov.uk have added the facility to search their own copy of the index. Importantly, and only having had a cursory look, their index seems to add the ability to look at mother’s maiden surnames prior to 1911, and ages at death prior to 1867. Both or which will significantly ease ordering of a correct certificate. It would appear that you have to be a registered user and signed into the site to see the index. I am guessing the data is from the aborted digitization of vital events (DOVE) project, so I am guessing was indexed from the originals, rather than the old indexes. This could prove a great help to many family mysteries, and saved wasted time and money ordering the wrong certificates. Is this the start of access to non certified copies from the historical indexes? One of my most interesting recent cases involved tracing a clients family back from the London suburbs to rural Oxfordshire, and the interesting discovery that my client’s great great great grandfather had been transported to Bermuda for a period of fifteen years for burglary! He did return to the UK after around 8 years. Finding ancestors with criminal records can always give a great deal of extra detail. For example, the ancestor in question who had been born about 1820, was 5 feet 7 inches tall, of fair complexion with dark brown hair and had a birth mark about an inch long on his left thumb! How accurate are birth dates on the 1939 register? The 1939 register from www.findmypast.co.uk has now been available for about 3 weeks. I have already used it on several occasions to help with clients research including two occasions where someones name has changed. The “exact” date of birth given by individuals and recorded in the register can be a great checking point against a birth certificate. But, how accurate are these dates? I don’t mean how accurate have they been transcribed, I mean do they tie in with the date of birth on an individuals birth certificate? So far, I have got dates of birth for 13 individuals who I also have birth certificates for. Of this admittedly small sample 100% have the correct day and month. 84% have the correct year. Unsurprisingly it is the oldest individuals that have the wrong years of birth, and all are recorded as older than they really are. What are you experiences? If anyone has some exact date I would love to compile some better statistics. When undertaking research for my clients, or in my own study, I am always on the lookout for sources that add more than just vital events. Whilst having dates of birth, marriage and death etc. are very important, that don’t put meat on the bones of the story. One unusual source that I have used on several occasions in my own research are justice of the peace diaries for various members of the Brockman Family, of Beachborough, Kent. The originals are at the British Library (Add MSS4259801) but the copies I viewed were on microfilm at what was the Centre for Kentish Studies in Maidstone, now at the Kent Library and Archives Centre in Maidstone. “Wm Griggs of Sellindge maketh Oath that last night after ye hour of nine his dwelling House in ye sd Parish was broke into and he misses from then sundry Mead to ye quantity of about a bushells as also a great Coat and further that a Lock was broke off from his stable door that when he came into that stable tis morning he horse was hot and wett and seem’d to have been rid in ye night as appeare further by ye saddle and bridle being wet and he has found such footsteps of a horse this morning that he has reason to suspect that said robbery may have been committed by Wm Barnes of Brabourne or Tho: Priggs of Hasting Lye or one or both of them, they being persons who have no livelyhood and of an ill reputation having been suspected of pilfering about the neighbourhood”. Sorry for the bad spelling, I have remained faithful to the originals! FindMyPast have announced that the much awaited 1939 register will be released on Monday 2nd November [link here], they do not mention a time, but I imagine whatever time of day it will be, that the website will probably melt down! To view a household from the register will cost £6.95 (this is above the cost of a subscription), although a bundle of five households can be purchased for £24.99, so costing about £5 per household. Reading subscribers views on the announcement there are many people who are very angry about the extra charges. However, I have managed to gleam from some of the replies by FindMyPast to the comments a little more about how the redacted information will work. Anyone over the age of 100 years old will be visible. If someone, who would now be less than 100 years old died before 1991, then they will be visible (I assume that the NHS who used this document were still updating it until 1991). If someone died after 1991 it will be necessary to submit a death certificate to have the record unlocked. I know what I will be doing on Monday morning! Of course, this burial record is vital in my research. Generally, first names have not been used. A lot of my ancestors have simply been known as ‘Griggs’. This makes it hard to ensure a newspaper article involves your ancestor or another with the same name. Secondly, the OCR (optical character recognition) used to index the articles is quite poor – but still better than no index at all. Thirdly, you never know what gems you are going to find! 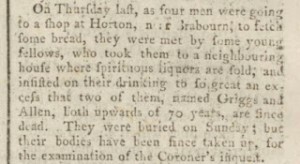 On Thursday last, as four men were going to shop at Horton, near Brabourn, to fetch some bread, they were met by some young fellows, who took them to a neighbouring house where spirituous liquors are sold, and insisted on their drinking to so great an excess that two of them, named Griggs and Allen, both upwards of 70 years, are since dead. 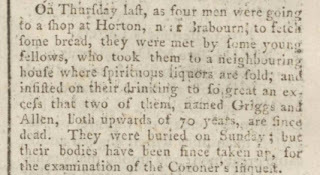 They were buried on Sunday; but their bodies have been since taken up, for the examination of the Coroner’s inquest. We have been informed by some of the company that were present, at Barbourn near Horton, with two men named Griggs and Allen, as mentioned in our last, and who are since dead thro’ excess of drinking; that they were not by any means compelled to drink the liquor, but drank of their own accord with the company then present. Neither have the bodies of the deceased been taken up, as was at first reported. So it seems like Peter was left to rest in peace after all. 1753 Tho son of Tho: & Sarah Fisher baptised Nov: 21. 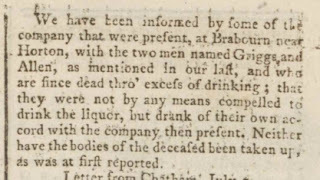 N:B: These persons left Horton sometime after Mich[aelmas] 1753 being apprehensive of his being taken as an outlawed person for smugling [sic]. By the way, Sarah, nee Griggs, was Peter’s daughter! Guess we will never know. Where did 11 days go? Today is 14th September, the previous date would universally be accepted as 13th September. But this was not the case in 1752 in Britain. As part of the switch from the Julian calendar to the Gregorian calendar (which we use now) and to realign the days with the seasons, 11 days were skipped. The day after 2nd September was the 14th September. I wonder how our computers would have coped with such a blip? I wouldn’t want to pay interest on my mortgage for them, but would be happy to be paid for the whole month. Don’t get me started on the new year beginning on 25th March – that’s for another day.